Las Campanas is my favorite place to watch sunsets. Unfortunately, we only have one star to watch rise and set each day–look how lonely it is. While we’re observing we are forced to fortunate enough to get to watch the sunset and sunrise before turning in for the day. If we lived on another planet, we might not have to stay up all hours of the night to see both sunrise and sunset. If we had multiple stars in our sky, sunrise/sunset might happen simultaneously, as it does on HD131399Ab for part of the planet’s year (which lasts about 550 Earth-years). This video shows what it might look like if we had three stars in our sky (which would make astronomy very difficult, by the way). In fact, the nearest exoplanet to Earth is also in a triple star system. If humanity ever manages to travel to and overcome the challenges to life on Proxima Cen b, our descendants may well get to enjoy such an experience. But alas, we are exoplanet imaging scientists, and Proxima b orbits too close to its star (and is too cold/not massive enough) for us to be able to image it. Thus, we’re sticking with HD131399. This is the first time that we’ve looked at this planet since we found it, and we’re really excited to learn more about its exotic orbit between its stars, and also more about its atmosphere thanks to MagAO’s infrared wavelength coverage. As you can tell, the planet is very faint compared to the stars, and the image requires special processing to pull out the faint signal from the planet. Since I stayed up all night taking the data, you’ll have to check astro-ph in the near future to see the new MagAO image of the planet. To avoid ostracization, I’ll refrain from posting the SPHERE image of the planet on the MagAO blog. The rest of the night we spent looking at dusty disks around young stars. 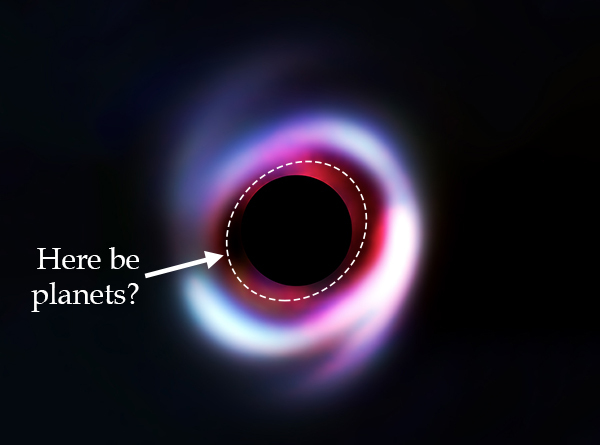 As giant planets form they open gaps in their disks, providing a means of targeting systems that likely have planets that can be imaged. MagAO is unique in that it can sense the light of very young planets in the midst of their formation (see, e.g. 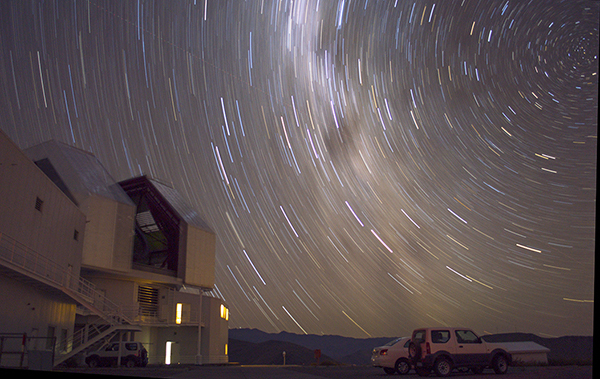 the MagAO image of LkCa 15). Tonight we tried one of my favorite disks, HD100453, which hosts a gap approximately the size of Uranus’s orbit around the Sun. 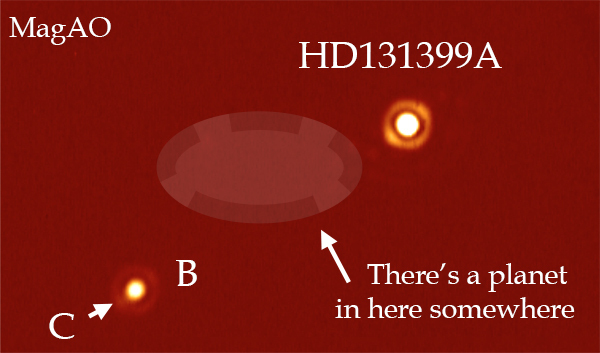 Keeping with the theme of multiple suns, HD100453 also has a second sun, orbiting just outside of the above image and driving the spiral arms in the outer disk. This is one of the final disks that MagAO is exploring for planets as the team completes their legacy Giant Accreting Planets Survey (GAPlanetS). The data are in and we’ll be working on them steadily over the next few weeks to bring you the results! Since we can’t have multiple sunsets on Earth, I’ll leave you with a galaxy-rise of a hundred billion stars as consolation (above the other Magellan telescope).